Composite anatomical artwork narrating the technique in endoscopy of the bladder. 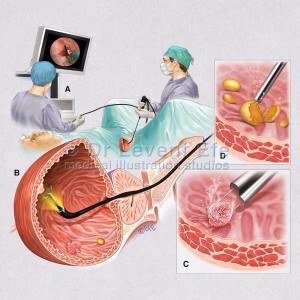 The flexible Cystoscopy procedure is carried out in diagnosis and treatment of several lower urinary tract conditions. SKU: U07. Category: Urology (URO). Tags: bladder, bladder_cancer, bladder_stone, cystitis, cystoscope, cystoscopy, flexible_cystoscope, urethra. 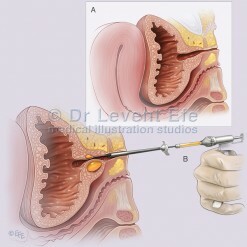 Cystoscopy technique – Medical illustration depicting the Cystoscopy procedure in a sequential format. A. Doctor inserting the flexible cystoscope through the patient’s urethra. This illustration series is an ideal visual tool for informing patients about Cystoscopy.